Robert (Bob) Sidney Smith (the pater) passed away peacefully after a short hospital stay on March 18th, 2017. Born 1928 he had a fascinating, adventurous, successful and happy life. He got his Master's degree, became a "Master" at the Teacher's College and then a Professor at the University, even editing his own "math" magazine! 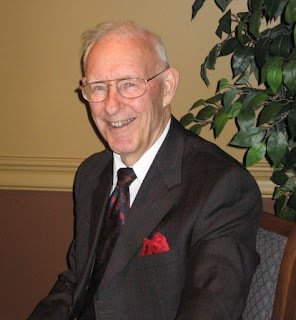 Dad enjoyed so many hobbies and interests including running, stamp collecting, traveling, golf, cross country skiing, music, tennis, bicycling, sailing, RVing, amateur theatre, cruising, visiting friends and family, bridge and cribbage, reading and singing in the church choir. Feeling bad that having been knocked down for the count in late January by a bad bout of the Flu the best I could manage was a phone call to him each day at the hospital. Guess I'm officially an orphan now :(. Posted by Idle hands, empty brain ... at 4:54 p.m. Single, child free, opinionated and independent! Well travelled, well educated, well read and reasonably intelligent. Pinner, cat slave, recovering cynic. Happy as I am now and looking forward to tomorrow. If my hands are idle, my brain must be empty! Found this a good history of Linen and it's place in the female world.